How to Convert MTS to Final Cut Pro for Editing? You have some interesting video in your HD camcorder in MTS and got some creative ideas to make your own style movie? You might have thought of Final Cut Pro. Yes, it is an ideal app to edit videos. To edit MTS footage saved in your HD camcorder, you need to import files in MTS to Final Cut Pro firstly. As we known, MTS is a common video format which can be supported by many camcorder devices in Sony, Canon, JVC, etc. But MTS cannot be supported by Final Cut Pro if you want to directly edit MTS videos with it. While what is Final Cut Pro? Final Cut Pro is a series of non-linear video editing software programs first developed by Macromedia Inc. and later Apple Inc. The software allows users to log and transfer video onto a hard drive (internal or external), where it can be edited, processed, and output to a wide variety of formats. Final Cut Pro provides non-linear, non-destructive editing of any QuickTime-compatible video format including DV, HD6V, P2 MXF (DVCProHD), XDCAM (via plug-in), 2K, 4K and 5K film formats. If someone would like to add videos on Final Cut Pro for editing, they have to convert MTS video to the format that can be supported by Final Cut Pro. Obviously, MTS format is not supported by Final Cut Pro. This article is mainly to help you to convert MTS video to Final Cut Pro format more easily. We have offered two ways for you to achieve your conversion. You can choose our product to convert your MTS video to Final Cut Pro format, or you can choose online converter to finish your conversion. Here Leawo Video Converter is highly-recommended and you can use this converter to convert MTS to Final Cut Pro on you Mac. 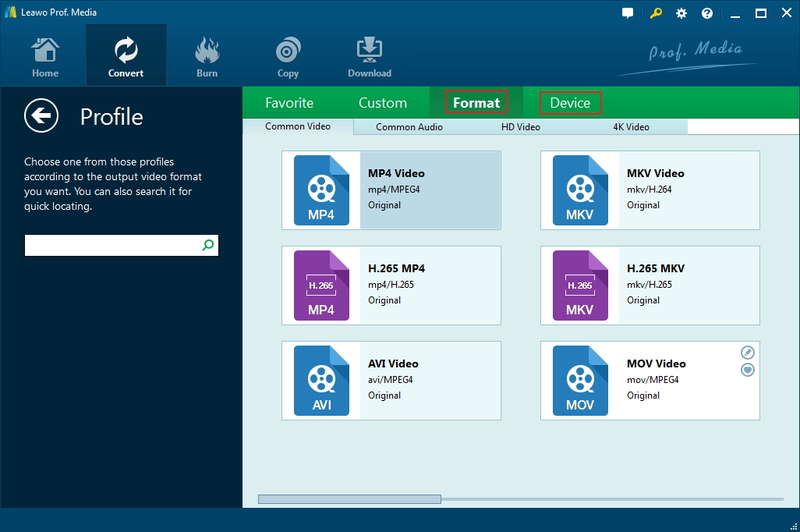 Besides, you can use this converter to convert MTS to many other formats, such as MP4, MOV, AVI, MPG, WMV, SWF, etc. How to quickly convert MTS to Final Cut Pro? Here we provide a complete solution for you. It is the right conversion tool that you are looking for to convert MTS to Final Cut Pro and supports all kinds of devices. Leawo Video Converter is a converting tool that you can convert MTS files to Final Cut Pro playable files with fast speed and high quality. Apart from MTS, you can also use it to convert to and from any other regular video and audio formats like MP4, M4V, MOV, AVI, WMV, FLV, MKV, etc. What’s more, if you want to edit MTS video on your iPad, iPhone, iPod, you can directly select the device preset as the output format. Step 1: Download and install Leawo Video Converter.Click the below button to download and install the program to your PC. Remember to hit the Mac button if you are a Mac user. Step 2: Add MTS files to the program. Enter the main interface, click “Video Converter” option to start import your files, alternatively, Click “Convert” in homepage bar to load MTS video that you want to convert to Final Cut Pro. And then click “Add video” button on the top of navigation bar to select the videos from mac or add the videos by dragging and dropping them into the program. Step 3: Choose Output format. From “Profile” drop-down list you can choose your output format according to your portable device, the search bar is recommended here which can help you find your desired format as soon as possible. You can also click “settings” to adjust output “video/audio encoder”, “Video/audio Bitrate”, “Channels”, “Resolution” and so on…. When you convert MTS video files, it allows you to do many video editing such as making special Effect for your movie, Trim any length segments, Crop playing area and more. After you have done all the steps above you can click “Convert” button to start your conversion from MTS to Final Cut Pro. Just wait a few seconds, and you will get the converted video for Final Cut Pro. Then you are able to add the converted video on Final Cut Pro for editing. Apart from Leawo Video Converter can help convert your MTS video to Final Cut Pro, you can also choose to convert MTS online. We will introduce Clip converter to you here. Clip Converter is a free online media conversion application, which allows you to convert and download nearly any audio or video URL to common formats. Below are the detailed steps. Step 1.After opening your Mac, please click official link to get into the website of Clip Converter. Step 2.Please paste your YouTube URL at ‘Video URL’ and press Continue after getting into the website. Step 3.After adding your MTS video on converter, please select Final Cut Pro format as output format. Step 4.When you have selected output format, please click “Start” to convert your MTS video to Final Cut Pro on your Mac. This may take several minutes. After the conversion is finished you can download the converted file. The conversion should only take few minutes to finish, actually, it is always depending on the size of the file you are converting. When it’s done, you can editing your MTS files at Final Cut Pro now. Both of these video converters offer a very easy way for you to convert MTS to Final Cut Pro. Besides, it can also convert MTS to iMovie, Windows Movies Maker and other video editing programs. Which one is your best choice is depend on your needs. For professional users, Leawo Video Converter is obviously better to use than online converter because it is more convenient and multi-functional to use. While for the ammeters, Clip convert can help you convert video without installation. So all in all, it is your choice.